On January 10, Oleg Deripaska (lead image, front left), the Russian oligarch who controls the state aluminium monopoly Rusal and electricity producer EN+, ordered his personal lawyers, Bryan Cave, into the New York State Supreme Court in Manhattan. There, court papers reveal that Deripaska is charging Paul Manafort (rear left) and his associates with “fraud, gross negligence, blatant disloyalty, and rapacious self-dealing”. Deripaska’s allegation is that between April and July of 2008 he was swindled out of $26.3 million. The court papers represent Deripaska to be a naïve partner in a business in Odessa, Ukraine, for which Deripaska did no due diligence; took no security over assets; kept no records; saw no accounts; and did nothing at all for almost a decade. In the New York court papers, Deripaska confesses himself to be unable to manage the smallest of businesses, let alone several multi-billion dollar enterprises vital to the economic security of the Russian state. According to Deripaska, Manafort and his partner Richard Gates “vanished more than $18.9 million”. The sum was invested by a Deripaska company called Surf Horizon Ltd., which Deripaska created in Cyprus in 2007, and which he controlled through a Moscow entity called B-Invest. The money was handed over to Manafort and Gates on April 15, 2008. In addition, Deripaska paid $7.35 million in “management fees” to Manafort between November 2007 and July 31, 2008. That was the last Deripaska claims he heard of his money. Read the court claim closely, for it is not correct that Deripaska is charging the two Americans with “vanishing” all of the $18.9 million. In fact, the court papers reveal the charge against Manafort is for a small fraction of that amount. The rest, as Deripaska is likely to know but is not admitting in court, went to former Ukrainian President Victor Yanukovich and his associates. Click for the full text of the New York court claim. 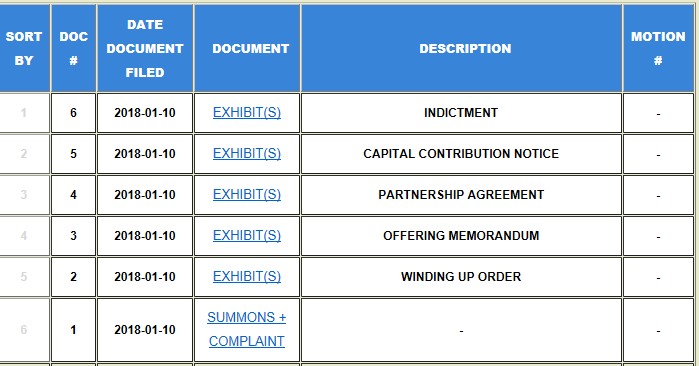 Court docket of filings so far in Deripaska’s case against Manafort. To open each of the exhibits, click on the court’s SCROLL website, then enter the case number 650130/2018. The case caption is Surf Horizon Ltd. v Paul Manafort, Richard Gates, and Pericles Emerging Market Partners. Source: http://iapps.courts.state.ny.us/iscroll/SQLData.jsp The indictment recorded as Document 6 in the case docket is the US Justice Department’s indictment released on October 30; for details and analysis, read this. Deripaska now claims that in the third week of April 2008, $17,804,160 of his money was paid by Manafort to Andrei Vityukov; Deripaska’s complaint identifies him as “a Ukrainian individual”. Nothing else is reported in the New York court papers about Vityukov. Deripaska is saying that this sum was for shares and assets of a group of Ukrainian telecommunications companies collectively called Black Sea Cable. He accuses Manafort and Gates of skimming $1.1 million from the purchase price for Black Sea Cable. What happened to the Ukrainian media and internet company isn’t reported in the court papers, except that the money and the company have also vanished, apparently without trace, at least in the US record. The Ukrainian record is more informative. Since 2016 reporters in Kiev have been claiming that Vityukov was a lawyer for Black Sea Cable. That entity, according to the Ukrainian evidence, was a front for Victor Yanukovich and his Party of Regions. Yanukovich had been prime minister of Ukraine between August 2006 and December 2007, when Deripaska and Manafort first began negotiating their deal. Yanukovich was then preparing to run for the presidency, which he won in February 2010. Yanukovich’s plan, it has been claimed later, was to use Black Sea Cable to establish media control in the city and region of Odessa to support his run for the presidency. After Yanukovich won, Deripaska had four years in which to collect from the president the return he wanted for his investment in Odessa. For details of Deripaska’s Ukrainian assets which benefited during that time, including the Nikolaev alumina refinery, vital supplier of feedstock to Rusal’s Russian aluminium smelters, read this. Deripaska has told the New York court he didn’t start looking for any of his money until 2014 – that is, soon after Yanukovich had been ousted in the coup d’etat of February 2014, and was himself living in Russia. Deripaska then filed lawsuits in the Caribbean, Cyprus, and US federal district court in Virginia in an effort to obtain bank records and statements of account. He is now charging Manafort and Gates, not with losing Black Sea Cable, but with stealing the difference between the money Deripaska had paid them and the money they paid for Black Sea Cable. 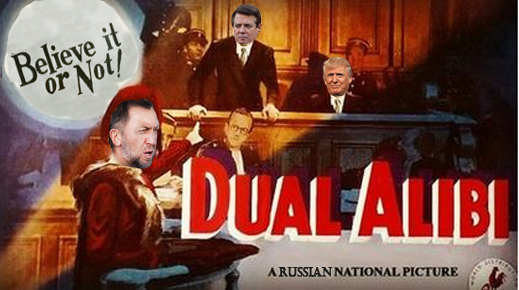 The Deripaska claim against the two Americans is for the difference. “Manafort and Gates did personally profit by the approximately $1.1 million difference. Of that approximately $1.1 million difference, approximately $500,000 was paid to Davis Manafort Inc., a corporation owned by Manafort, and approximately $425,000 was paid to Gates or companies owned by him”. For all that the New York court file discloses, Deripaska may already have recovered from the Ukrainians who took over Black Sea Cable whatever he and they agreed to, before Yanukovich lost power. Manafort has yet to answer in his own defence, when he may provide details of what the political and media plan was for Odessa between 2008 and 2014. So was Deripaska deceived by Manafort’s credentials in 2008? Did they matter when Deripaska had reason to believe he was investing in Odessa media ahead of Yanukovich’s run for the presidency? Why has it taken Deripaska a decade to investigate and lay his $1.1 million claim against Manafort, when he is also implying in court that the “vanished” balance of $17.8 million may have reached Ukrainians intended by Deripaska, and not have “vanished” at all? 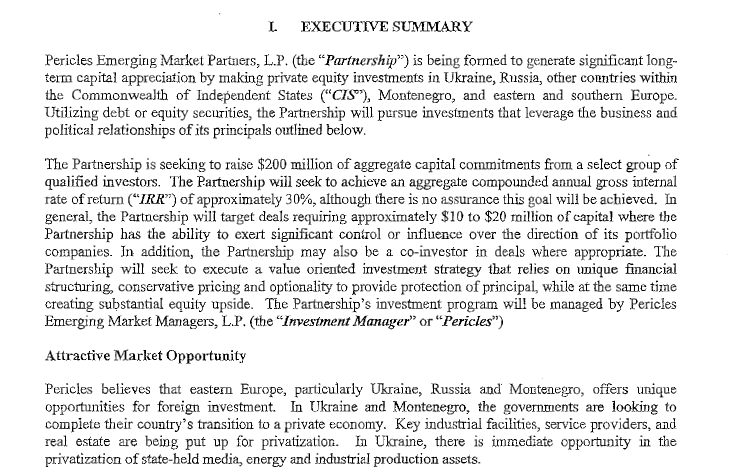 Deripaska’s claim against Manafort reports they had agreed in an “offering memorandum”, dated December 2006, to “generate significant long-term capital appreciation by making private investments in Ukraine, Russia and other countries within the Commonwealth of Independent States (“CIS”), Montenegro, and eastern and southern Europe.” Read the offering memorandum in full. In the meantime, Deripaska is making the case that he wasn’t buying influence in US elections from Manafort. Instead, he was employing Manafort to buy influence in Ukrainian elections – money which, until the overthrow of Yanukovich, Deripaska appears to have regarded as very well spent.